Gov. Greg Abbott is adopting a wait-and-see approach about anticipated legislation that would prohibit transgender people in Texas from using the bathroom that corresponds with their gender identity. “I have not seen any proposed legislation yet,” a characteristically cautious Abbott told reporters Tuesday at the Capitol. He added that there are still a number of things unknown that could determine the need for such a bill. Among those variables, Abbott said, is the legal challenge to President Barack Obama’s guidelines directing public schools to accommodate transgender students. The incoming administration of GOP President-elect Donald Trump could bring an end to that dispute, which was an impetus for the push for a so-called “bathroom bill” in Texas. “We are in the information-gathering stage right now,” Abbott told reporters when pressed on his views about a potential bathroom bill. Whatever. 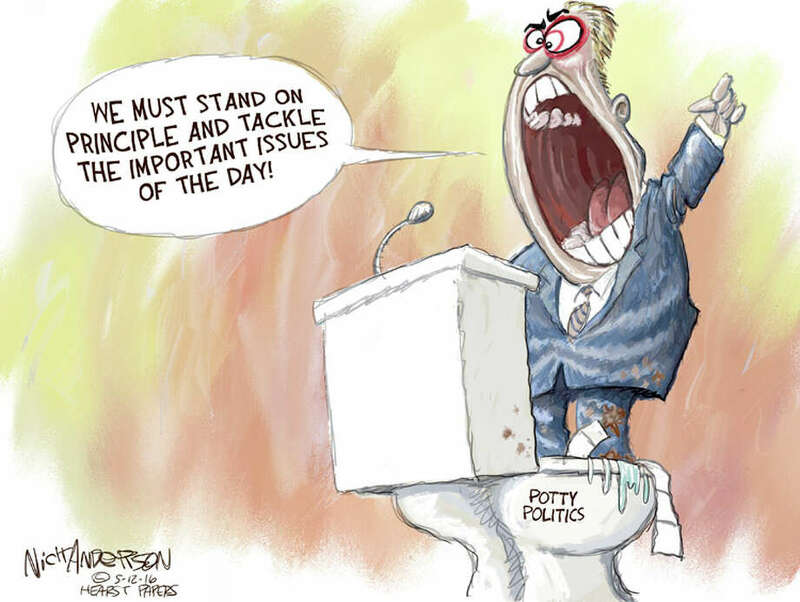 This is basically of a piece with the Buckingham statement that may or may not have represented a tentative stepping back from the original intent of the Patrick potty bill, but let’s be clear that the impetus for this was not school bathrooms but the HERO fight and the recognition that whipping up a frenzy against the transgender community struck a chord with GOP base voters. It’s only now that the business community has kicked up a fuss, much to Patrick’s disgust, that some Republicans are maybe, possibly, could be dialing it back just a bit. I remain dubious, but there does appear to a change in rhetoric, and it is worth noting. But let’s not lose sight of what this was always all about, and what Dan Patrick and his fellow travelers still want it to be all about. They may settle for something smaller this session if they feel they have to, but that doesn’t mean they’ll be satisfied if it happens. By the way, the embedded image comes from this Gray Matters post by Cort McMurray, in which he demonstrates his facility for inventing potty-based nicknames for Dan Patrick. You should definitely read it. Well, of course he is wishy-washy. Abbott is somewhat of an adult (relative to Patrick) and is playing to the business folks in the state who are adults. But not shooting it down completely which keeps the right-wing base in suspense. Patrick is totally playing to the base because he will surely be gunning for Abbott’s job in the future. It’s a rare moment, because I basically agree with your post. Abbott is being pragmatic. it’s a safe bet that Trump’s folks will rescind that “guideline” from the O administration, and that should end the matter.